My online income is down nearly 800 dollars this month and I.DON’T.CARE. I’m enjoying the start of summer and having a blast spending more time taking care of me. I used to spend every free minute that I was not in my 9-5, working on my side businesses. Ever since I made my health a priority, I’ve had less time to work on this blog and my Etsy account. The cool thing is that my income stayed over $2,000 despite putting less time into it. Passive income is a cool thing. 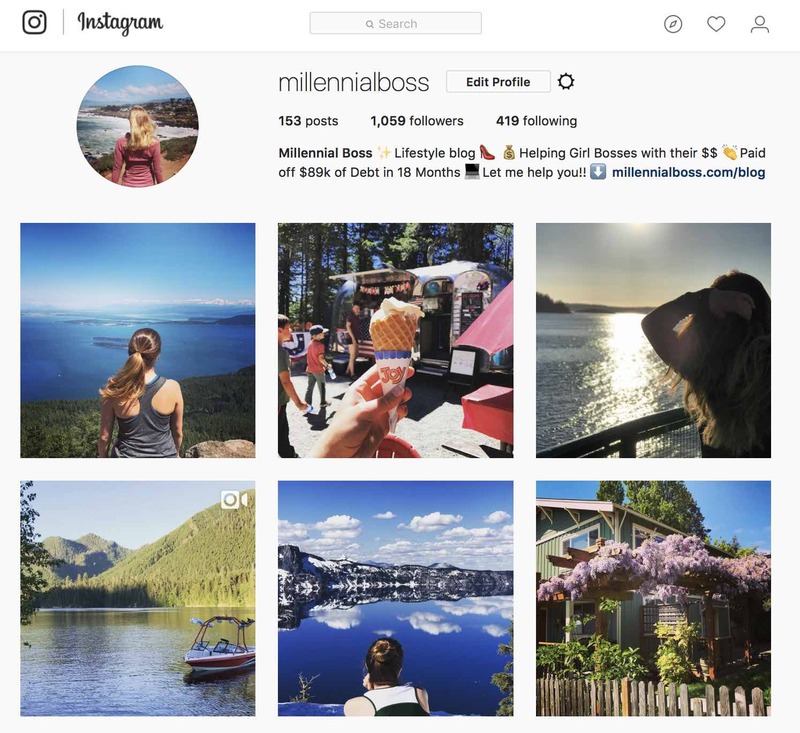 If you want to see what I’m up to in real life, follow my Instagram account @MillennialBoss. As I mentioned, I’ve been working on my health this month and have started hiking a lot more, doing yoga with ClassPass, and lifting. ClassPass has been pretty awesome and I still can’t believe I signed up for 5 yoga classes this month for only $10. I like that I can schedule classes at different studios and even when I’m traveling. It’s also really easy to cancel as long as you cancel within 12 hours. I’ve admittedly cancelled twice but I’m a busy gal (and sometimes I lose my motivation to workout that day). If you want the discount I received, sign up for ClassPass here and get your first month for $10. This site has changed over time. I actually named it “Millennial Boss” because I wanted to share tips for millennials who found themselves in management positions. I then started writing about debt payoff because that is what I was going through at the time. I paid off $89,000 of student loan debt. The “Millennial Boss” title quickly took on a different meaning. I started learning more about the FIRE movement and getting into that, so it became more about being a “boss” of your finances. My latest kick I would say is entrepreneurship. 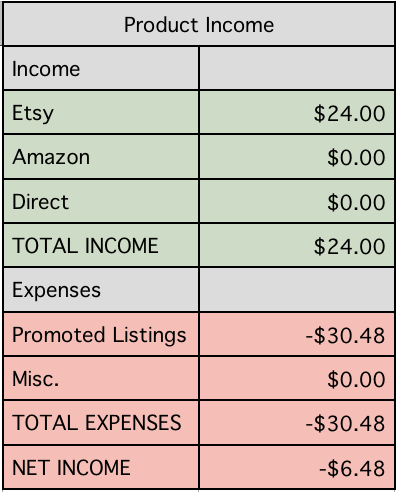 I find side hustles intriguing so I started posting this monthly income report series to catalog those adventures. I still work a 9-5 (THAT I LOVE) so this is just a fun side gig for me. In no way does this money pay my bills. I find it pretty cool though that I’m earning money on this site, and I want to share my experiments and progress in these income reports. 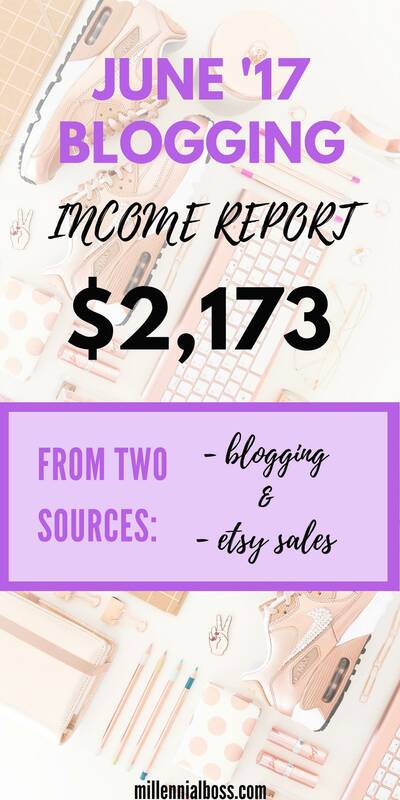 and of course my May 2017 Income Report, where I shared I made $2,853. It’s been fun to add the “Feature Friday” posts in to the lineup. On Fridays, I share stories about people who have paid off student loan debt or are entrepreneurs. **If you want to be featured on Feature Friday, learn how. I had a traffic spike at the beginning of June but something weird happened with my FlexOffers account where the reporting stopped working. 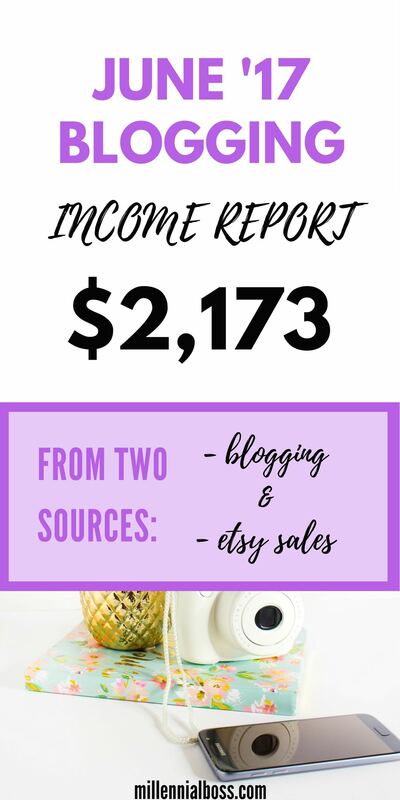 It showed no income earned despite the crazy traffic I was getting to one post (and when that post gets traffic to it, it makes money). I still do recommend FlexOffers since I’ve earned thousands from it already this year, but I switched one of my highest performing products to another platform. FlexOffers has since credited my account for the money I earned but it took a few weeks. They were very responsive during the time that the reporting was messed up so points to them. Try out FlexOffers here and see if any products you love are available for promotion. I started paying for PicMonkey which is a cool image editor/online photoshop tool. One of the pins I made using PicMonkey is starting to go viral on Pinterest which is cool. It’s an image with a gold sparkly overlay which is very easy to make with PicMonkey. As you can see, PicMonkey is pretty cheap too. Sign up here for PicMonkey and try out its features. Rockstar Finance offered an opportunity for promotion on their site and I jumped. They have really great personal finance content from a variety of bloggers. I’ve actually never been featured on Rockstar Finance so this was a cool way to get on the site. Either way, $50 is not that much money for promotion. I’m still calculating the return, however. The amount of referral traffic I’m getting is lower than expected. Beyond the new blogging expenses, I write about my regular blogging expenses in the 15+ tools I use to monetize my blog. I recommend reading the post if you don’t know about any of the expenses I have listed. EDIT: I just downloaded the Pinterest Strategies Ebook and read the whole 95 page ebook in one night. If you’re a blogger and you haven’t read this – I’m not joking- get this. 100% endorsement here. This is the first “meaty’ ebook I’ve bought and the Pinterest Strategies in here are legit. Check out Pinteresting Strategies here. What happened this month, Etsy? I had only 2 orders this month to 9 orders and nearly $200 earned in May. I’m so bummed. Truthfully, I need to spend the time investigating why my products are not converting this month. I had many views to the listings and people favoriting the listings but lower conversions. Either another seller came into the space or my ads need tweaking. Alas, I need more time in my day to get to this stuff. It’s just lower on my priority list for summer. I did take a bunch of pictures that I can use to promote the products and probably should take more when I have a free weekend. I need to edit them and upload them to the listings. I didn’t work with any clients this month for 1×1 coaching. Usually people sign up with very specific questions they want answered about blogging or entrepreneurship. If you want to talk to me about something specific, schedule an hour with me here. I’m no expert by any means but I can help someone get to the point that I’m at now. I started reporting my social goals and following the past few months. Last month I said I wanted to grow the Millennial Boss Facebook page but I just didn’t have the time to focus on it. Hopefully I’ll have more time this month (but likely not). I share things on social media that I don’t share on the blog, so I recommend you following me there if you like the site. That’s a wrap on the monthly income report. Let me know if you have questions in the comments below. Also, share what you’re doing! What is working for you in the side hustle space? Yay for passive income! Looking after your health is important, and so is enjoying some time off in the summer! How awesome is it that your older blog posts are still consistently making money each month. I am working on my Pinterest game at the moment so I might have a look at PicMonkey. Good luck for July! I use the premium version of Canva as well but PicMonkey has the layering feature like photoshop which I really like. It also has better fonts I think. Good luck! I hadn’t heard of FlexOffers before this post, but will have to keep it in mind. Any specific things you’ve promoted with it that have worked out the best? I recommend Personal Capital and Swagbucks. Awesome results! That’s pretty awesome passive income! What were your page views for June? Do you manual pin? Or use Tailwind/Boardbooster? I use tailwind/boardbooster. I’ve been getting between 30-50k pageviews per month. Hey! I just read your comment on my blog. I’ve been reading your blog for awhile, so I was shocked to see that you were reading mine as well! Anyway, I love what you’re doing on your site. If you’d ever like to collab or guest post on my blog, please let me know. I think we’d be a great fit for each other’s blogs. What a compliment! Of course I read your blog 🙂 I would love to collaborate and likewise for mine! Nice nice! Great work and congrats on another great month! Good stuff as always. Nice to hear that you’re enjoying summer though. Blogs are built through slow and consistent work, not crushing yourself while you could be out on a hike. Even though you say you’re putting less time into it, I bet you’re getting a lot more done by all that thinking / unwinding that happens on long walks. They say Warren Buffett spends hours and hours each day just thinking and Bill Gates is famous for his “think weeks” where he goes away to a cabin and cuts himself off from the world.